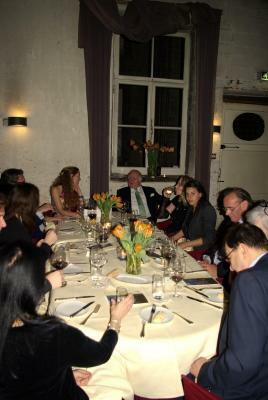 On Friday March 18, the annual LSG TEFAF Dinner took place at Chateau Neercanne. After an aperitif we set down for a delicious dinner before exploring the famous wine caves of this charming castle, enjoying a cheese board and some fine port. Over 70 of our most important clients and relations attended our dinner. As always, the table setting was a big surprise. With people that never met driving each other home at the end of the evening, someone thanking us with the remark that she was sure she found new friends and two of our guests finding out that they had met each other ten years earlier, our dinner again served its goal as an informal meeting place, where delicious food and good company were the main ingredients.